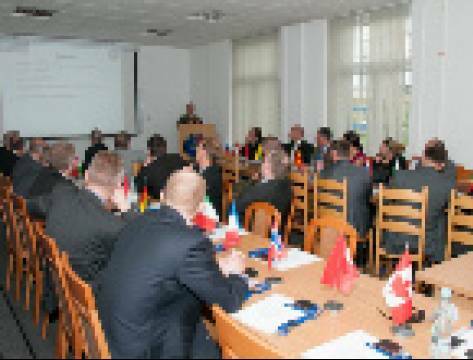 The meeting of the representatives of the NATO Military Police (NATO MP) formations took place in Bydgoszcz on 13 - 16 May 2013. The MP Panel was held as part of the Land Operations Working Group (LOWG). The conference was chaired by the Chief of the Canadian MP, Col Timothy Grubb. The meeting was also attended by the Provost Marshal Allied Command Operation, Col. Willem Koops and the Director of the NATO Military Police Centre of Excellence (NATO MP COE), Col Grzegorz Wasielewski. In total, 40 representatives from 13 countries participated in the Panel. The MP Panel reviewed the NATO MP doctrinal and standardisation documents. The delegates also discussed the future NATO MP capabilities and the work on the development of necessary documentation in that respect was initiated.– The Danish MP took over the presidency over the work on that aspect. On 14 May the NATO MP Panel representatives visited the NATO Military Police Centre of Excellence. During that visit the Director of the Centre presented the detailed roadmap for the NATO MP COE development and its programme of work for the years 2013 and 2014. The visitors were also provided with information on the support given by Support Unit of the NATO Joint Force Training Centre (SU JFTC) to the staff of the NATO MP COE. Finally, the Deputy Head of the NATO MP COE Education and Training Branch, Lt Col Mirosław Łabęcki, discussed the current scope of work on the Education and Individual Training Directive (NATO 75-7), including its impact on the training and education of the NATO Military Police. During the visit at the Centre the guests had the chance to attend the exhibition of historical and modern weapons used in armies around the world. The exhibition met with their keen interest. The Chairman of the NATO MP Panel positively referred to the issues presented by the NATO MP COE, recognizing the achievements in the process of the Centre establishment and its plans for the next two years.